Over the years, drive-in theaters have become increasingly hard to find. That’s why Stars and Stripes Drive-In Theatre makes it onto our list things to do in New Braunfels TX. Showing the latest releases in Hollywood as well as classics, this theater has something for every age! Tune in your radio and blast the sound of the movie in your car, giving you that surround sound theater atmosphere! Bring a small battery operated radio and cuddle up with your loved one under the stars in the back of a truck bed and feel like a teen again! Grab a hot chocolate from the concession stands on a chilly night away from the bright city lights. A drive-in movie is a true hidden gem so when you find one, take advantage! 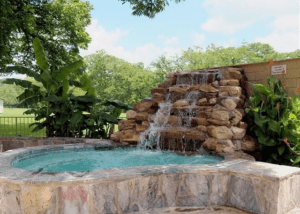 Be sure to add Comal Springs on your list of sights to see and things to do while in New Braunfels TX. The crystal clear spring waters of Comal Springs are a real treat for every age to adore. 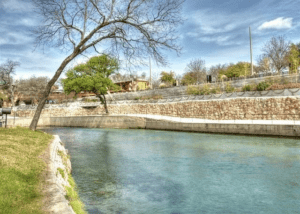 For the best views of crisp, beautiful Comal Springs, head to Landa Park. Designed for leisure, you’ll be able to swim in one of the gleaming natural spring pools at this park, which uses nature to their advantage. Take a miniature train ride or view the springs on an afternoon stroll. You’ll hear children laughing and birds chirping all while wading in the Comal Springs at Landa Park. Guadalupe Brewing Company offers rustic tin siding, friendly beertenders, and a large tap list. As a bonus, they have a food truck that sells delicious made to order food. Beer lovers can relax with a brew inside or out in a shaded area in the beer garden at this pet-friendly hidden gem. From classic ales, seasonal beers, and impressive stouts, this brewery has something for every palate. Cheers to the best brewery in Central Texas! It can be time-consuming looking for hidden gems, even when they’re all around you on vacation. Luckily, we’ve got you covered with our top favorite things to do in New Braunfels TX! Our charming New Braunfels lodging here at River City Resorts is a short distance away from discovering a whole new world! To view our spacious lodging, visit our website, or call 1-830-626-2196.